After a brief hiatus to get acquainted with our new granddaughter, the countdown continues. 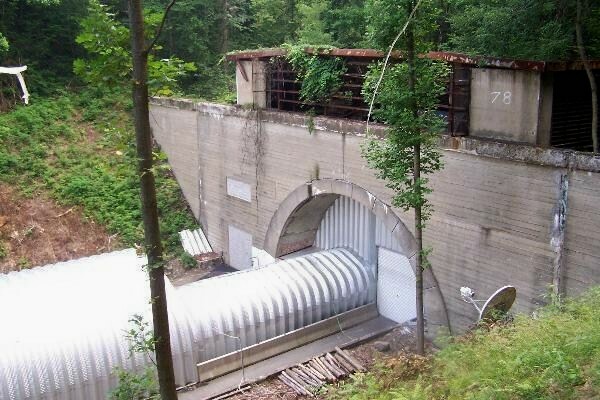 This is a Pennsylvania cache from July 2005 called The Spooky Tunnel. When people think of my native Pennsylvania, they usually think Pittsburgh and Philadelphia – urban areas. In fact, most of Pennsylvania is heavily wooded and mountainous. The Allegheny Mountains run northeast to southwest through the center half of the state. Part of these mountains run through Somerset and Westmoreland counties and are called the Laurel Highlands. This is the area where I grew up and it looks much as it did 200 years ago – trackless woods as far as the eye can see. Through the middle of all this, the state built a four lane highway that would eventually run east-west from border to border – the Pennsylvania Turnpike. Modeled after the German Autobahn, it was the first high speed highway in the U.S. Construction started in October 1938. The first 160 mile section from Pittsburgh to Harrisburg opened for business on October 1, 1940. Construction and expansion have been ongoing ever since. The original design envisioned speeds of up to 100 mph. The road was designed to maximize straightaways and minimize curves and hills. To do this, they built a series of tunnels through the mountains instead of going over them. One of these was the Laurel Hill Tunnel. Its story is told in the pictures that follow. 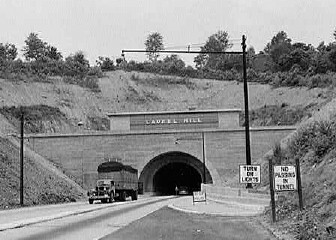 A view of the Laurel Hill Tunnel in the 1940’s. It was originally designed and excavated as a railroad tunnel at the turn of the century but the railroad never got here. It was incorporated into the Pennsylvania Turnpike which opened in 1940 as the nation’s First Superhighway. This rugged woodland is a geocachers dream. It has everything from one star drive ups to five star expeditions. 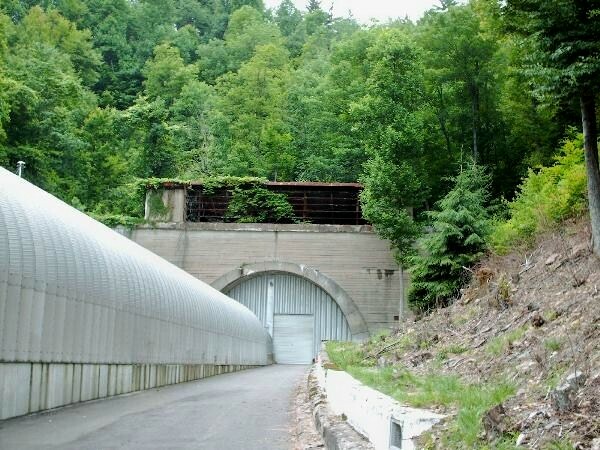 Overlooking the long abandoned Laurel Hill Tunnel is the three star Spooky Tunnel geocache. My son and I tackled it in July of 2005. It was our first summer of geocaching. The problem with the Laurel Hill Tunnel is that it only had two lanes and the turnpike had four. It became a two-ended bottleneck. Even in the 1940’s and 50’s, traffic jammed up at both ends. As cars and trucks became bigger and faster, the traffic got worse and the tunnel got more dangerous. 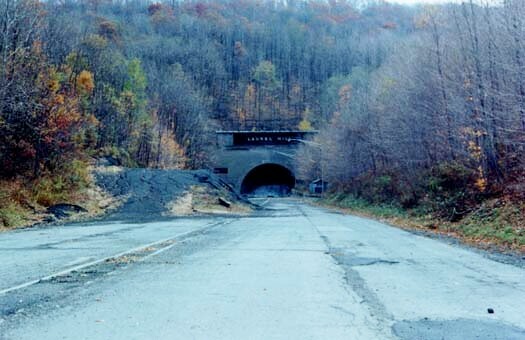 There were horrific crashes in and around the tunnel during its years of use. By the early 1960’s, something had to be done. That something was to forget about 100 mph straightaways and build a six lane road over the steep mountain, bypassing the tunnel completely. The Laurel Hill Bypass opened in 1964. The now abandoned tunnel lay dormant for years. This a view from the early 1980’s. The hardest part of the cache is figuring out which back country road goes to the parking pullout. Once parked, it’s about 1/2 mile of bushwhacking to get to the cache. There’s no trail and the summertime brush, the bugs and old barbed wire fences can be challenging. The cache itself is well hidden (at least it was) and the heavy overhead canopy can make the GPS go crazy. The abandoned tunnel served a variety of ad hoc purposes for 30 years after it was abandoned. It was used as a garage for maintenance vehicles, storage for road sand and salt and a police firing range. Up until the early 80’s, you could walk or bike through it. Around 2000, the tunnel became the scene of intense activity. No Trespassing signs were posted and the State Police patrolled it heavily. Structures resembling airlocks or decon stations went up along with barriers and satellite antennae. The whole thing was sealed off with no outward evidence of activity or occupation. People began to speculate about all the things that might be going on there. Department of Defense? Homeland Security? Nuclear waste? Archaeological dig? Alien spacecraft? You can’t miss the tunnel. Just keep walking downhill and you’ll run right into it. The view of the tunnel from the cache site is awesome. It’s completely out of place in this remote area but there it is, satellite antennae and all. After years of speculation, the answer finally got out, thanks to the Internet. An engineering company that develops NASCAR racing technology bought the tunnel and turned it into a giant wind tunnel. They wanted to keep it quiet but you know how that goes. Now, they have a website that tells all. It’s pretty interesting. The place is strictly off limits but a geocache was placed above it in 2003. It’s still there. This is a geocacher’s view of the (Not So) Spooky Tunnel. Anyway, we had a good time getting it and bagged several more in the same area that day. As I’ve said before, some of my best days as a Dad were out geocaching with the kids and this was one of them. BTW, if you’re interested in who is using the tunnel and what they’re doing, here’s the tell all website.